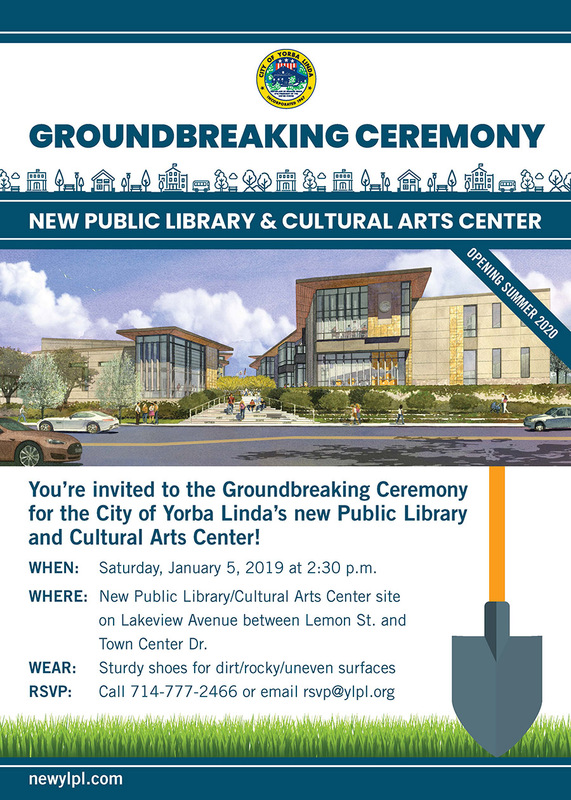 On January 5, 2019, the community of Yorba Linda, CA, gathered on the site known locally as the strawberry field to commemorate the groundbreaking of the city’s new public library and cultural arts center campus. The Cultural Arts Center is a wholly new parks and recreation facility – to include art studios, a black box theater, dance studio, music and art rooms, and an outdoor amphitheater – and a two-story library designed to accommodate not only current library collection and program demand (currently, library events “sell out”), but will offer a variety of meeting and community spaces, dedicated reading and study areas and use spaces, and DIY studio. 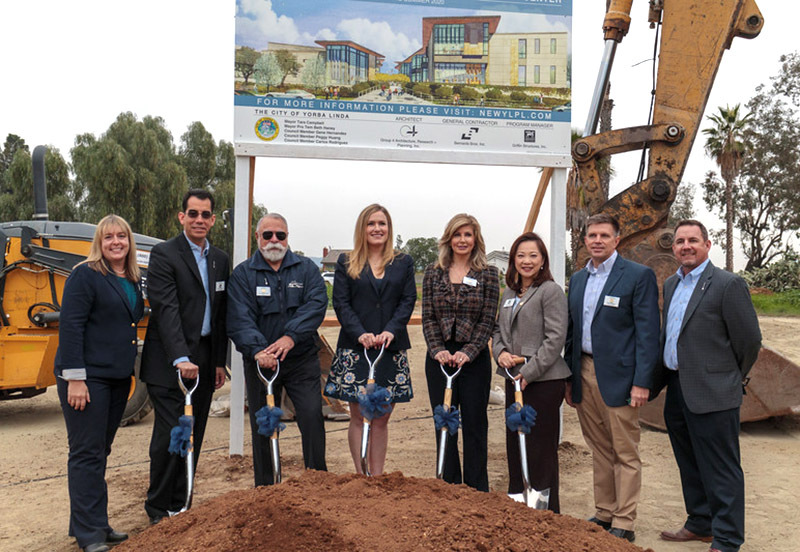 The paseo between the buildings will include plantings, outdoor seating, connection to the Town Center shopping district, and potential for conversion to community markets and other events. 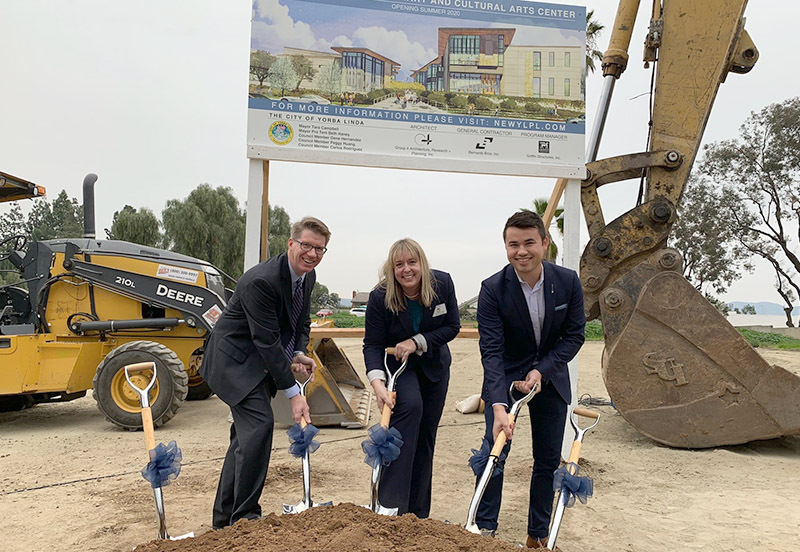 Reporting on the event, the OC Register noted how years of development have led to the expanded, jointly operated civic campus. The Public Library and Cultural Arts Center is scheduled to open in Summer 2020. Above: Group 4 principal Jonathan Hartman and associate Ben Irinaga join Library Director Carrie Lixey at the groundbreaking shovels; Below: Ms. Lixey (left), joined by (left to right) City councilmembers Carlos Rodriguez and Gene Hernandez, Mayor Tara Campbell, Mayor Pro Tem Beth Haney, councilmember Peggy Huang, City Manager Mark Pulone, and Parks and Rec Director Mike Kudron; Bottom: City flyer for the groundbreaking event.